The science of Numerology is 2500 years old. It believes that there are certain vibrations which are associated with us when we are born depending upon the time, date and the place of our birth. Numbers 1-9 are used to define these vibrations. 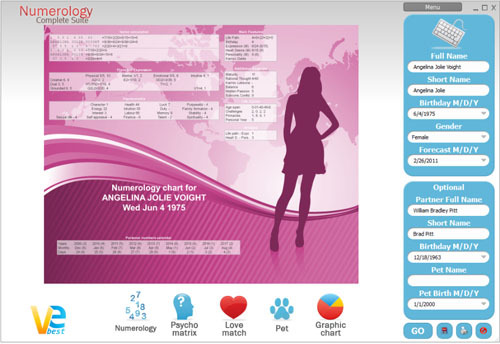 The numerological love meter works on the following method. The letters of the alphabet are given numbers 1-9 and these values corresponding to the letters of the names are added to get a number. Then the digits of the answer are added until we get a single digit answer. This value is found for the names of both the partners. The two digits thus obtained are used to tell the compatibility of the couple. For example, if the values of the names of the two people who want to take the test are 6 and 9, then according to the numerological principles, they both make a highly compatible couple and have a great amount of love between them. On the contrary if the values obtained are 6 and 1 then the two people are not compatible at all according to the science of numerology. Thus these rules are accumulated and a love meter is formed. It requires the names of the two people and after making the necessary calculations, it generates the result. This application can be a nice fun filled activity as sometimes it does generate the real result along with a solution for incompatibility if any. This can be helpful for many couples. But one should not take this seriously and if needed, then one should consult a professional numerologist.